For the carne mechada: Heat oil in a large frying pan on medium-high heat. Sauté the onion and peppers for 3 minutes or until onion is translucent. Add garlic and sauté for 1 minute, while constantly stirring. Remove from heat and let cool. Season the skirt steak with salt and pepper, to taste. Cut the meat into large chunks and place them in the slow cooker. In a medium-size container, combine beef broth with tomato puree, Worcestershire sauce and ground cumin. Pour the mixture over the meat. Add chopped tomatoes, sautéed onions, pepper and cilantro. Cover the slow cooker and set to cook on low for 7-8 hours or until the meat is tender and can be pulled apart easily. Turn off the slow cooker and shred the meat with the help of 2 forks. For the quesadillas: Heat the flour tortillas on a comal or on a nonstick frying pan on medium-low heat until they are soft so you can bend them easily. 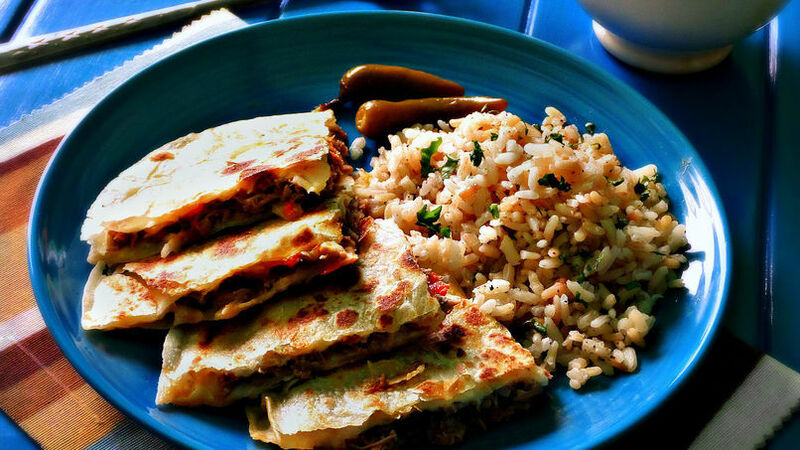 Add 2-3 tablespoons of grated cheese to each tortilla and 2-3 tablespoons of carne mechada. Fold quesadillas in half and toast them on the comal or frying pan until they are lightly golden and the cheese has melted. You can also serve the carne mechada in tacos, toast, burritos or enchiladas. Carne mechada is a typical Venezuelan dish. It’s usually served with white rice and black beans, a combination known as pabellón criollo. Carne mechada is a dish that’s full of flavor and one that can be enjoyed on its own; it can also be used as the juicy filling for empanadas, arepas and even quesadillas. It’s super easy to make if you do it in the slow cooker and it’s perfect for those days when you don’t want to spend a lot of time in the hot kitchen. The best thing about carne mechada, in addition to its incredible flavor, is that it goes a long way and is perfect for family gatherings during the weekend.